We have started our new season. Please check us out on Facebook Gladstone Robosavages 2. Like and share if you please. We could use some help going to the worlds. gladstonerobotics	/ March 5, 2015 / Comments Off on We could use some help going to the worlds. We are sending 3 teams two the worlds. Unfortunately it is expensive to go so we could use some financial help. We will be running the school store for a few weeks, so come buy something from us. Our school’s amazing talanted Musical theatre group will be putting on a joint fund-raising musical show on Friday March 27th. Please come and support our students, both the talented in robots and in music. Tickets are only $5. You can choose from several ways to have your donation used. Help send students whose families are having a hard time affording this great but expensive trip. Help us buy some much needed new parts or upgrades. Sponsor directly the registration of one of our three robots. Robot registration is $1000 dollars and sponsoring this will let you “name” on of our robots. Hey also check out these links of our students in recent interviews. BC Provincials Results?… For the eighth year in a row, we are going to the World Championships! gladstonerobotics	/ March 5, 2015 / Comments Off on BC Provincials Results?… For the eighth year in a row, we are going to the World Championships! 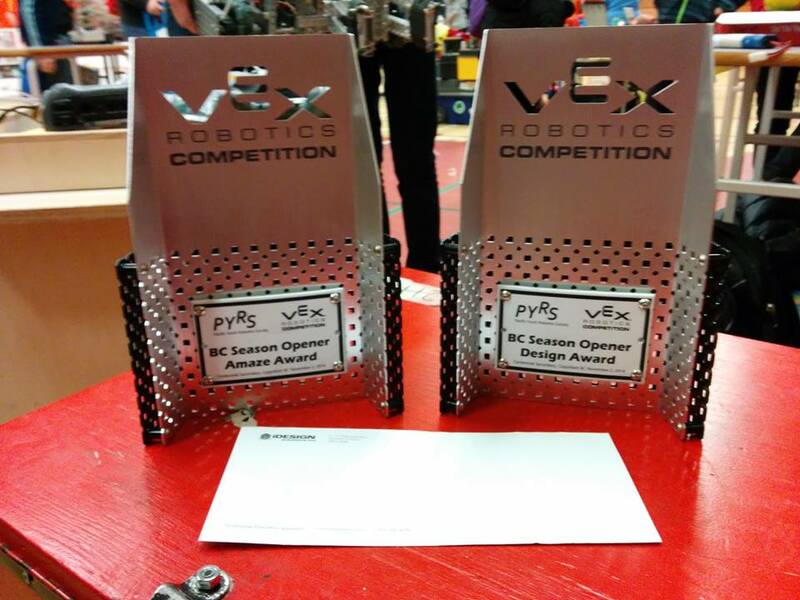 Seven Robosavage teams competed with 32 others at the BC Provincial Championships held at Alpha Secondary. We were able to qualify three robots to represent Gladstone at the Vex World Championships in Louisville, Kentucky. Good job to all the teams for another fantastic tournament. Alpha Secondary did a great job of hosting the tournament. Thank you to parents, teachers, and friends that came out to support us. Saturday, January 17th we will see over 40 teams from around the pacific northwest compete at our winter tournament held in our gymnasium. Gladstone competed at BC December Qualifiers at Fraser Heights Secondary! Congratulations to 2Y and 2F for taking home tournament champions, earning two more placements for the upcoming BC Provincial Championships. In addition, good work to 2Y for winning a Create Award. Thank you to all our alliances, and hope to see you guys soon. For more information on the December 6th tournament please go to the robotevents website here. Nov 15th Tournament in Richmond, B.C. gladstonerobotics	/ November 26, 2014 / Comments Off on Nov 15th Tournament in Richmond, B.C. 7 of Robosavages’ teams went to the BC Fall Qualifier at McMath Secondary in Richmond. The school was an excellent host to all of the teams that attended. Please go to our facebook page to see some pictures. Also remember to like our page! We had a great day competition wise with all of our robots making it to the elimination rounds where four won their way to the finals. We earned 6 out of the 10 awards and took home eight trophies tonight. Shout outs to 2B, 2C, 2W, who all made it to eliminations as well as special thanks to our alliance partners and supporters. And again, thank you to McMath for hosting the event and to PYRS for running the event. Team 2Z and 2X did a great job at representing the Robosavages this weekend. We even earned a spot in the BC Provincial Championships. Thank you for everyone that supported us! The first event of the year will be held on Sunday Nov 2nd in Coquitlam. We plan on sending at least two teams. We have started our robots for VEX Skyrise. Everyone is trying out various designs. The First competitions will happen during November, hopefully we will be ready by then.